Relationship Speakers Network Presents Michael Najarian, M.A. personal appearances on my behalf!" Dr. John Gray's popular "Mars & Venus Relationship Seminars" and his "Mars & Venus Personal Success Seminar" have benefited hundreds of thousands of people all over the world. By special arrangement with Personal Growth Productions, we are pleased to announce that we can now assist you in booking Dr. Gray's personally trained representive of the "Mars and Venus Seminars," Michael Najarian, M.A. to appear at your next event! Michael Najarian is the President of Personal Growth Productions and former colleague of Dr. John Gray, Ph.D. He was Dr. Gray's appointed ambassador of the Mars/Venus message performing to sold-out audiences in theaters across the U.S. and Europe. With a penchant for showmanship, Michael enchants audiences with his special brand of humor and insight about Martians and Venusians. Fifteen years of working and studying with Dr. Gray has made Michael a master of the Mars Venus material. As a result, Dr. Gray personally sponsors Michael's public events and heartily endorses him for private functions. 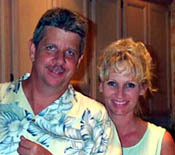 Michael and Susan, his wife Michael is the father of three daughters and a son. held our attention for the entire 4 hours! Thank you for a very special experience!" Additional references and fees are available upon request. For more information about available dates to schedule Michael Najarian, M.A. for your next meeting, please contact. . .